Shoveling snow can feel like moving a ton of bricks sometimes. There’s a reason people call that wet, heavy white stuff heart attack snow. According to the American Journal of Cardiology and Lancet, the number of ischemic heart disease deaths rose by 22% during the week of a major blizzard and stayed above average for the following 8 days. A study from the Centers for Disease Control suggests 1,200 Americans die during or after a blizzard each year. Of course, that’s not suggesting that snow shoveling is any more risky to your health than riding your bike, going for a swim, or taking a jog. 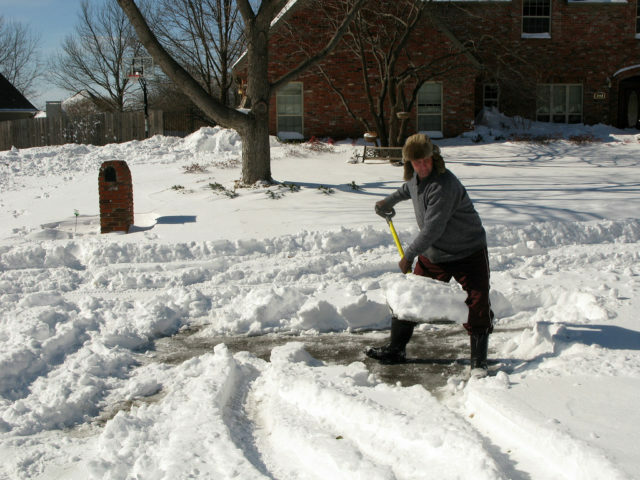 But what these figures do suggest is that a lot of people who have sedentary lifestyles or are generally unfit put themselves at risk for severe, acute health problems when they engage in a task as physically demanding as shoveling show. And that’s where the term heart attack snow comes from. Why is wet, slushy snow so much harder to move around than dry, fluffy snow? A shovel full of dry snow may weigh as little as 5 pounds. A shovel load of wet snow is as heavy as 20 pounds. That’s one huge difference! It’s like picking up a bag of sugar versus half a sack of concrete. No wonder shoveling wet snow can be so dangerous for some unfit people. Of course, lifting 20 pounds at the end of a shovel can be a workout for even the healthiest people — it’s especially taxing for those who have to shovel a whole driveway after blizzard conditions. Snow shoveling can be downright dangerous for people who spend most of their time sitting at a desk. Sometimes, people who are unfit have little choice but to take up their snow shovel and plow their sidewalk or driveway. It typically costs anywhere between $30 and $100 to hire a professional snow plowing service, though costs vary by the size of the driveway and the amount of snow that’s fallen. If there’s any ice to chip away, then the cost goes up. So, how do you know if snow shoveling is causing you health problems? If you experience any of these symptoms, immediately stop the snow shoveling and call 911. I’m no doctor, nor do I play one on TV, so you should check with a medical professional before taking any my snow shoveling tips. However, there are plenty of helpful ways to make shoveling snow easier and — hopefully — less harmful to your health. Before you begin shoveling snow, you should warm your body up with some basic stretches. Move snow the shortest distance possible. If you’re going to be lifting snow, you might as well not have to dump it too far away. Push the snow rather than lift it. This will exert less stress on your body. Don’t rush the job. It’s better to take your time shoveling snow and take frequent breaks if you tire quickly. Take smaller loads of snow. Don’t pile too much snow on your shovel, especially if it’s wet snow.